Are there any experts on the 1kz-te fuel injector pump? I've noticed starting is getting harder and harder on my Hiace, and this was due to the fuel draining back to the tank. There are no secondary pumps, the one mechanical pump does it all. I discovered this by operating the primer pump (that knob on top of the big fuel filter) and it would be an easy pump for a while and then stiffened up when the system was full of fuel again. The only way for this to happen is if air can get into the system somewhere, and after pumping/priming the system solid again I noticed two wet patches of diesel. 1. One was near/on the primer - so simple and easy to fix with a new filter and head. 2. The 2nd is more serious, it's on the mechanical injector pump around the engine speed sender. I think these air leaks are also starving the engine of fuel when hot and it's working, possibly the one on the primer is allowing air to be sucked in. My injector pump has always been very dirty on top which I put down to road dirt, now I realise that this has been leaking for some time and obviously needs to be fixed. (Note that this is actually the engine speed sender connector). Note in this photo the leak has dried, but the whole surround of the large nut rapidly gets damp when pressurised by the primer pump. The problem is that this sensor looks like it could be installed from inside the pump cover, rather than just screwed in from the outside, so I'm wondering about the best way to fix this. Does the pump have to come out? Can the cover be removed in situ? Has anyone seen how the sensor fits into the lid? As an update I've fixed this issue now. The top cover was cleaned with brake cleaner and garage tissue swabs and a brush. Once clean the ring-nut was unscrewed by 2mm. Then around 2 feet of thin plumbers PTFE was wrapped around the threads underneath the nut. Then the ring-nut was re-tightened and on testing the leak had been stopped. This is the same pump cleaned and fixed (I still need to clean the connector LOL). I suspect this is a rare issue but you never know - if the top of your pump is black you may have a leak (the weeping diesel attracts the dirt). If you are ever tempted to unscrew the 4 allen bolts and lift the lid you'll need to unscrew the ring-nut (32mm) first as it's just the connector for the speed sensor coil embedded deeper inside. I think the speed sensor is what is (also) fed to the tachometer, because the tacho drive frequency has no relation to the engine rotation, so I suspect the signal originates here in the pump. There's a toothed metal sender that generates the pulses so there cold be any number of pulses per revolution. 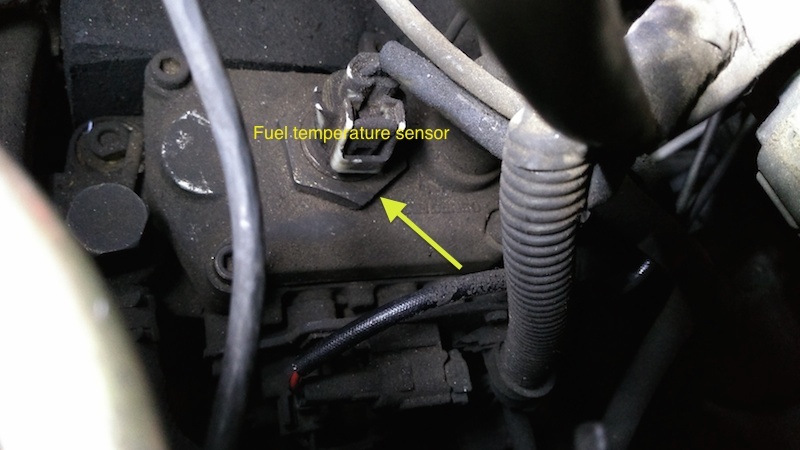 E.g: (this diagram has also has the temperature sender on top, looks like Denso sold it with a top or side option, on the Hiace it's on the side).